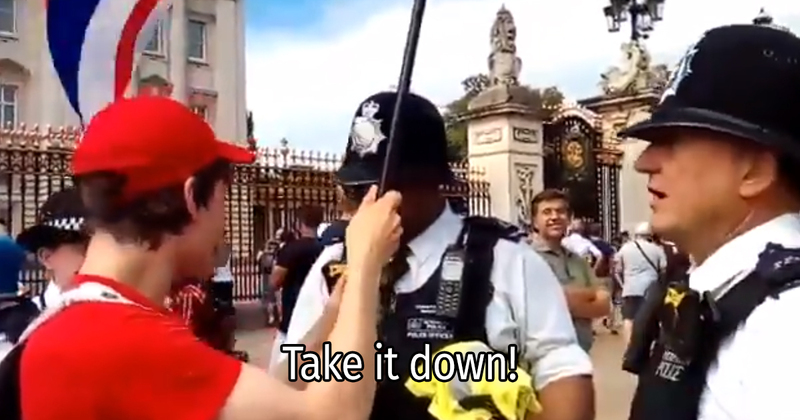 British boy told by police to remove "offensive" British flag outside Buckingham Palace or risk arrest. Every year Muslims used to take to the streets of London to show support and declare loyalty to their favorite terror organizations, Hamas and Hezbollah. They proudly fly Hezbollah and Hamas terror flags and no one tells them to remove it. But these British patriots are forced to remove "offensive" British flag. The police are becoming our enemies - they, and the Justice system, certainly! They brought public condemnation down on themselves, willingly! Nobody wants your offensive brutish flag anywhere!